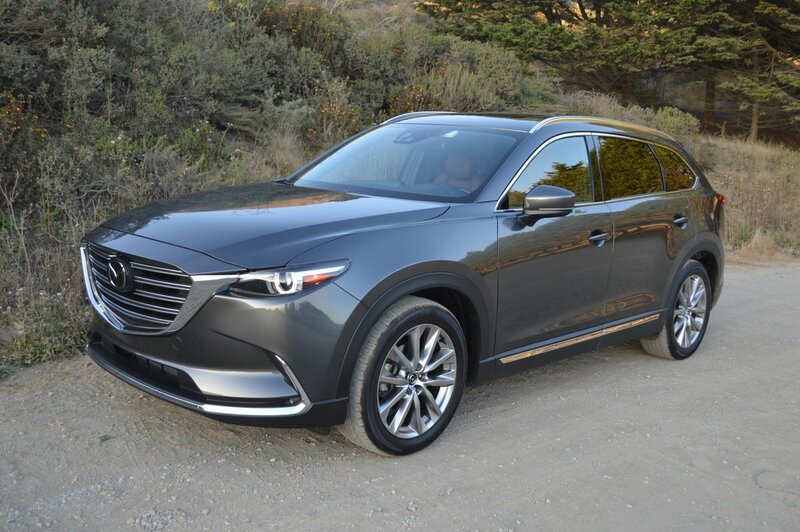 During the recent unprecedented heat wave in Northern California I took refuge from our non air conditioned house inside Mazda’s plushest SUV, the Signature edition CX-9. 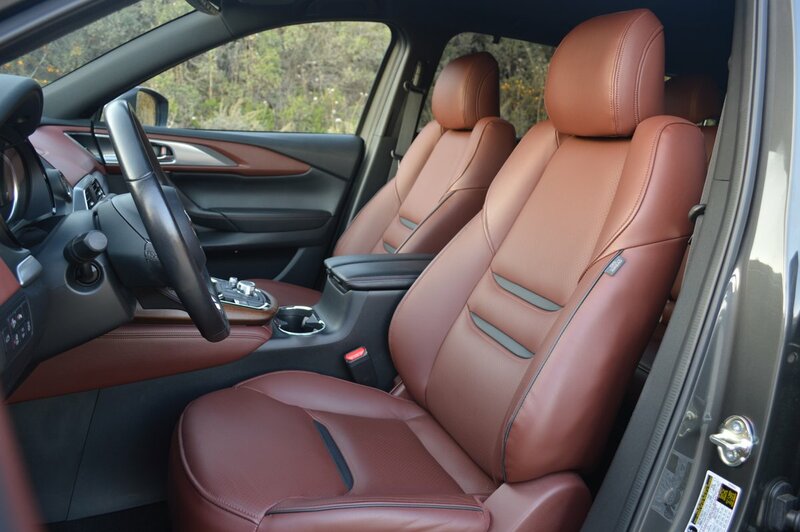 With the air conditioning cranked down to 60 degrees, I spent enough time in this 3 row, 7 passenger SUV to appreciate fully the comfort and beauty of its cabin design. 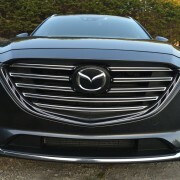 The Signature edition is Mazda’s top offering in the CX-9 model line, with real aluminum embellishing real rosewood everywhere you look. The Signature’s luxurious matte finished wood comes from Fujigen, the Japanese guitar maker. 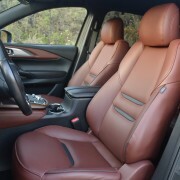 This interior quality substantiates Mazda’s television commercials showing artisans finessing steering wheel leather and fashioning rosewood accent panels. 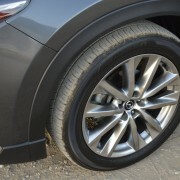 Everything about the CX-9 Signature reeks quality and care of construction. 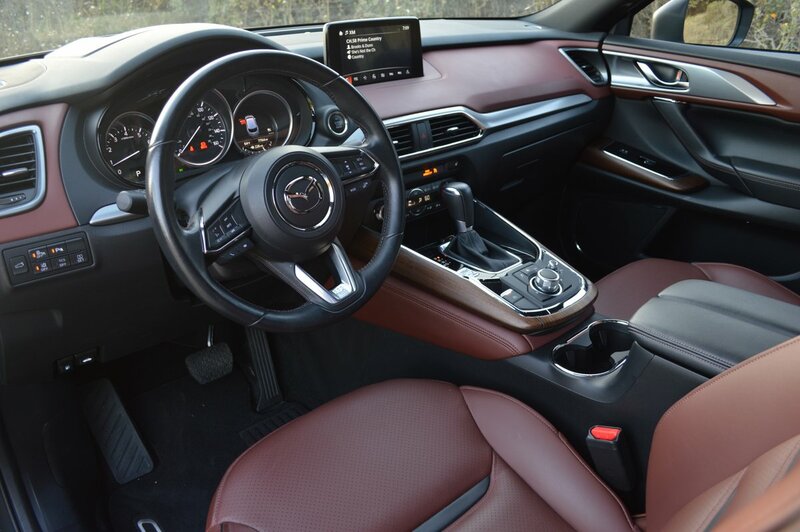 My stint in the cool cabin also gave me the unaccustomed opportunity to become well acquainted with the CX-9′s arcane dial-controlled infotainment system. After a half hour of self-motivated study, I reluctantly concluded that this dial and screen pony show is way too difficult to learn, let alone master. Even the simplest entertainment requests require much dial twisting and bumping to accomplish. 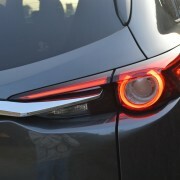 The standard navigation system is somewhat easier to operate, and rather more logical in its demands. 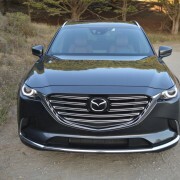 Since all this proved confusing and obtuse from the passenger’s seat of a stationary CX-9, I can only imagine how much concentration it would demand while actually driving. 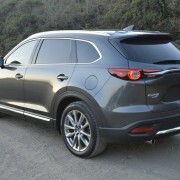 Fortunately, the act of driving the CX-9 is ever so much more pleasurable than trying to retune its infotainment complex. 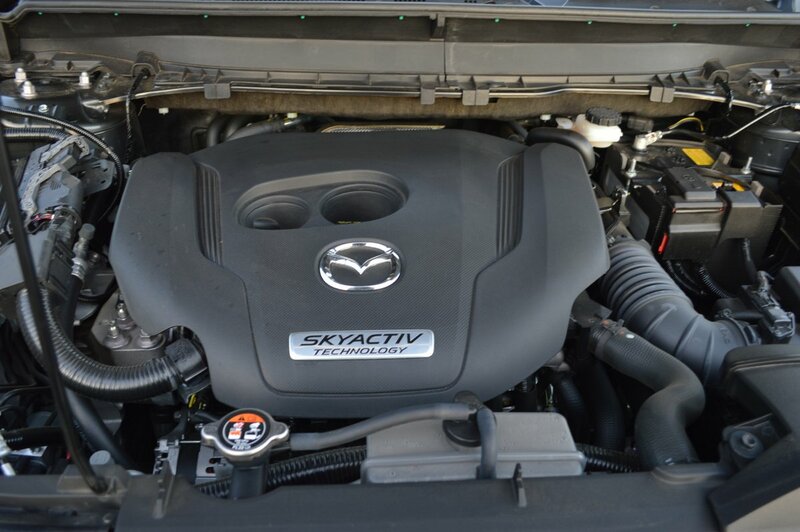 Under that long snout of a hood (heavy and unequipped with hydraulic struts) lies a very impressive engine. Of modest size (inline 4) and displacement (2.5 liters), this turbocharged torque maker produces a surprising 310lb.-ft. of motivation, good for a two rating of 3,500 pounds. 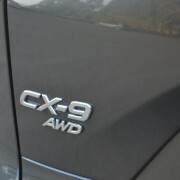 But its horsepower rating of 227hp remains rather modest for a 4,585lb. 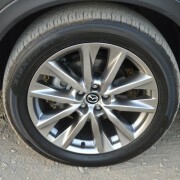 vehicle. 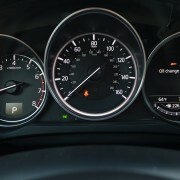 You can up horsepower output to 250hp by spending extra for hi-octane fuel. 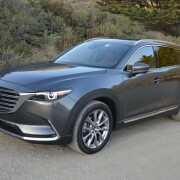 There’s really no need to do so, however, as the CX-9, at 227hp, moved out smartly thanks to its compliant and smooth shifting 6-speed gearbox. 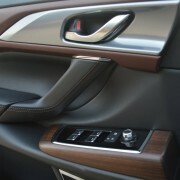 Though you can do the manual gear dance with the shift lever on the console, paddles at the wheel would have been nicer. However, you can control the gearbox shift points by selecting “Sport” on the console mounted mode switch. 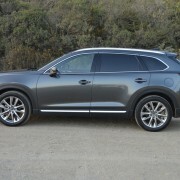 As you might expect from the company that still builds the world’s number one affordable sports car/race car (The MX-5 Miata), the CX-9 stints on absolutely nothing when it comes to suspension, brakes, wheels or contact patch. 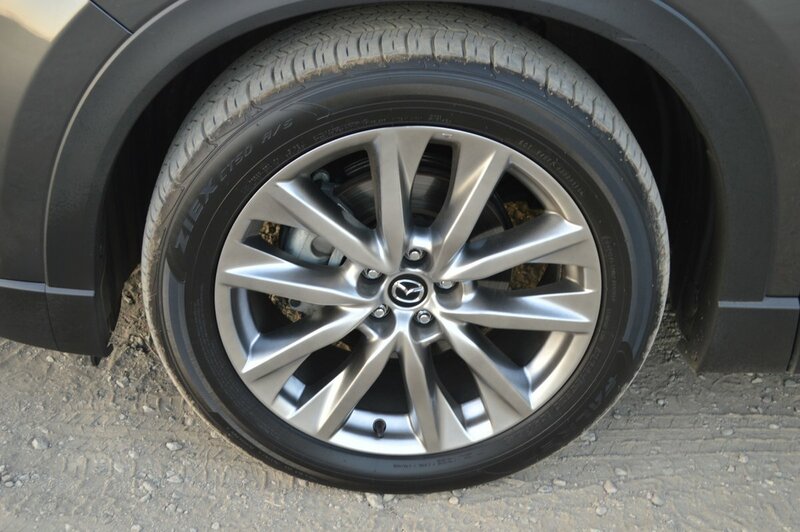 Take suspension, for example, which is fully independent front and rear for a leech-like grip on the road and a plush ride in the cabin. The electronic power assisted steering provides solid road surface feedback, and the Signature’s standard 20 inch alloy rims second the motion through the substantial footprints of the Falken Ziex CT50 AS tires, which measure 255/50R20 at each corner. 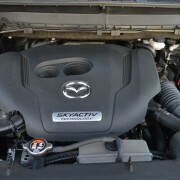 Standard anti-sway bars front and rear are another Mazda hallmark that insure flat cornering in tight turns. 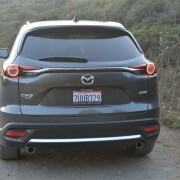 While I wouldn’t put the CX-9 in the Miata class for sheer driving fun, compared to most elephantine SUVs in this 3-row class, it’s a joy to drive. 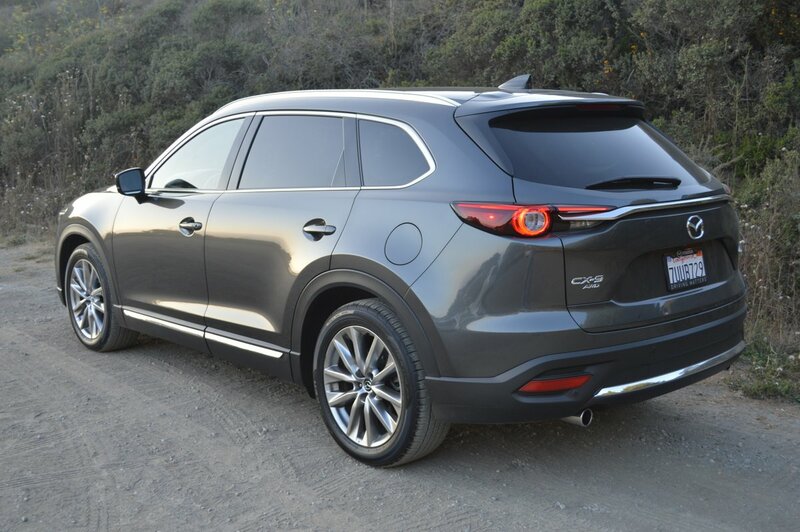 In addition to its athletic prowess as a sporty driver, the CX-9 does duty as a pack horse with room to spare. 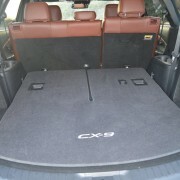 For example, if you drop the pair of rear seats, plus the 60/40 second row, you open up 34 cubic feet of interior storage. If you need more than that, you should be looking at Chevy Suburbans or Silverado pickup trucks. 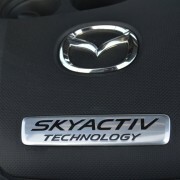 Now that it’s getting oppressively hot inside my house again, it’s time to seek refuge once again inside the welcoming, ritzy, comfy cabin of that Machine Gray ($300 option) over Auburn leather (standard) Mazda lurking in my driveway this week.